It's less than 24 hours to TVB actor Ruco Chan and actress Phoebe Sin's big day. The pair will be tying the knot tomorrow (Oct 13) at the Four Seasons hotel in Hong Kong island. The banquet is expected to be a private affair with only close family and friends invited. In an interview with Oriental Daily, Chan promised to give his wife-to-be an unforgettable wedding, while Sin promised to spare him from the traditional wedding-day pranks played on the groom. Despite her busy schedule, the bride-to-be's good friends, former Miss Hong Kong pageant contestants Tiffany Lau and Joyce Ngai, managed to throw her a surprise bachelorette party earlier this week. In a post on Instagram, Sin wrote that she almost cancelled their planned meet-up, but was convinced to "just come by for an hour". Hong Kong TVB heartthrob Ruco Chan tied the knot with 28-year-old budding actress Phoebe Sin on a yacht in Hong Kong on Saturday. The 41-year-old actor-singer arrived on a speedboat before boarding the yacht for the ceremony. They exchanged their vows in the presence of 50 guests. "Although I was excited, I had a good night's sleep as I wanted this to be a memorable moment for the two of us," said Chan. Chan was dressed in a black Chi­nese tunic suit with a gold dragon design on the left chest while Sin wore a high-slit red qipao and embroidered high heels. accompanied by groomsmen, former ATV actors Derek To and Jerry Leung and Phoebe’s good friends, Tiffany Lau and Joyce Ngai. The actor announced his engagement and impending nuptials in a Weibo post on Sept 10. Sin is a former Miss Hong Kong contestant. She joined the pageant in 2016. The pair's relationship was exposed early last year after they were caught on a date at The Peak. Chan has denied accusations that Sin came between him and rumoured flame Nancy Wu. Chan is one of TVB's most eligible bachelors. Wedding bells will be ringing next month for TVB actor Ruco Chan, 41, and Phoebe Sin, 28. Another one of Hong Kong television's most eligible bachelors is officially taken. 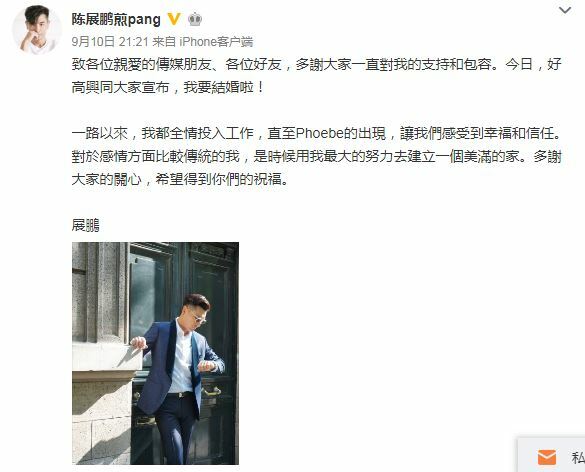 41-year-old actor Ruco Chan announced on Monday (Sept 10) that he and 28-year-old TVB newcomer Phoebe Sin are engaged and they will be getting married in October. The pair's 'underground romance' was thrown into the spotlight early last year, after the couple got caught by paparazzi on a date at The Peak, Hong Kong's famed tourist spot. Since then, Chan also had to deal with accusations that Sin had come between him and popular actress Nancy Wu. Chan has since clarified that Wu is merely a 'good friend'. Chan and Sin recently flew to England presumably for a holiday, but it was soon revealed that a more pertinent itinerary was at hand - a surprise wedding photoshoot. And the sneaky groom-to-be had it all planned without Sin's knowledge. In an interview with Ming Pao, Sin said Chan had proposed earlier with a heart-shaped ring made of paper when they were in Hong Kong, but she'd rejected it as "it lacked sincerity". "My heart said yes but my mouth said no," she joked. She was only told about the wedding photo shoot when they were preparing to set off on their trip. However, his intention shouldn't have come as a surprise, as Chan had told the media at an event in July that he had marriage on his mind. Chan said he chose England as the backdrop for the shoot because Sin, a former Miss Hong Kong contestant, had studied there and he wanted to create "more beautiful memories" for her in a place she loved. Chan's second proposal at the shoot went off without a hitch, after he went down on bended knee on set in front of a London bus, with the loving moment captured on camera. The unscripted pose took Sin by surprise, she said, as she believed it's something that's hard for Chan to do in public.